The World Cup will be remembered for the surprises. From the winner to the surprise performance of New Zealand and the newcomer South Africa, the World Cup kept on surprising the pundits. Pakistan won the tournament after their magical turnaround when they were on the verge of elimination. Luck did favour them, as they saved one point of defeat as their match against England resulted in a draw, when after being bowled out for just 74 runs, they were staring at defeat. Yet luck could not have made them champion. 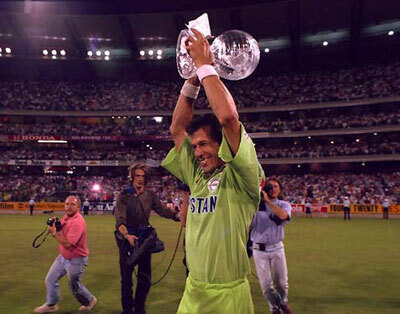 The exploits of their two greatest crickets Imran Khan, the captain, and Javed Miandad were ably supported by the future greats such as Wasim Akram and Inzamam, not to forget Rameez Raza and others. New Zealand, the hosts surprised all and probably themselves too by winning against all but the champion Pakistan. They won 7 of their 9 matches till semifinal. Unfortunately they lost both matches against Pakistan. On the other hand the other hosts and defending champion Australia appeared mediocre and could not enter semi-finals. The suprise element was also the motivating performance of South Africans, who were playing their first World Cup after their entry to World Cricket in 1991. They reached the semifinarose tol and could have been the original finalist too. But the Rain Rule played the cruelest cricket joke on them and they were forced to lose in the semifinals against England. England entered their 2nd consecutive final and failed to lift the trophy again. From Lord’s (1979) to Kolkata (1987) and now in Melbourne they could not lift their game in the final. India on the other hand wrote a disappointing story winning just 2 matches. West Indies on the other hand looked impressive, yet they could finish 6th only, behind Australia and other finalists. Sri Lanka and Zimbabwe could not rise to the occasion. Zimbabwe had just one win (against finalist England) to boast, while Sri Lanka managed 2 wins. The Benson and Hedges World Cup proved a turning point as it brought color to the World Cup in terms of dress and match features such as balls, screen and also the day night matches. The stage was set for Indian subcontinent to host the World Cup again and among the three only Sri Lanka was yet to win the World Cup.